Now I was on Planet Japan. People still had 2 arms and legs, but so many things were so very different from the small country town where I grew up. But I was open-minded and hungry for knowledge and experience -I began to carry around a dictionary and notepad with me wherever I went. When I heard something I did not understand but sounded useful, I would either look it up on the spot, or make a note of it to look up in the dictionary later. I would try to do this with at least one or 2 words per day, and then use those words in real situations as many times as possible that same day. This is how I learned Japanese. I never studied the language in school. The summer in Hiroshima is unbearably hot-especially for Canadians. I grew up playing ice hockey on frozen rivers. Here, temperatures were in the high 30s centigrade, but the worst thing was that humidity. By 8 or 9 o’clock in the morning, you were already covered in sweat. I got used to walking around with my clothes sticking to me like what felt like “saran wrap.” Not the easiest thing to get used to. The weather very slowly began to improve by September, and since I was now into the swing of things with my work schedule, it was time to get my Japan martial arts training under way. Through my karate instructor back in Canada, I got the contact details for the closest instructor in my style (Chito Ryu). Kanao Sensei lived 2 hours away by train, in the city of Fukuyama. Since that was too far for me to travel in time for regular weeknight classes, he agreed to meet me on a weekend. His cousin spoke some English, and was the facilitator for our 1st meeting. 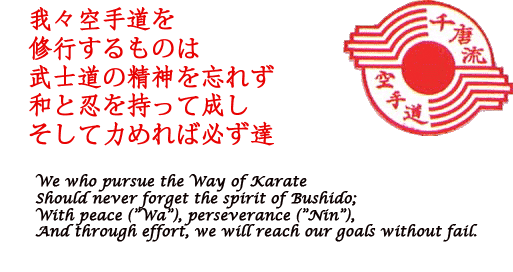 Kanao Sensei was a 4th Dan at the time, which in our style meant that he was a senior instructor. There were no easy black belts in our style. In fact, if you weren’t Japanese, you weren’t even allowed to get a black belt in Japan in Chito Ryu. Kanao Sensei graciously agreed to teach me on the weekends. I would take the train two hours to Fukuyama and he would teach me at his home, in the garden behind his house and in his car garage if the weather was bad. Sometimes I would stay overnight and we would train both days. We did a lot of Kata training, and a lot of Makiwara training, which involves punching a target over and over, and over and over, and over and over, hundreds of times. 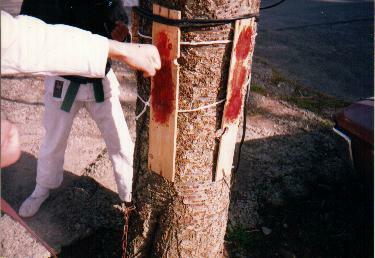 For untrained fists like mine, the target, a post or tree, was wrapped with rope made of rice straw (Maki = to wrap; Wara = straw – sometimes thin boards were substituted, as shown in the photo below). After a few dozen strikes, my tender knuckles would split and begin to bleed, and after a few hundred repetitions, the straw rope would be covered with blood. Sometimes this was followed by knuckle push-ups on the concrete floor of the car garage. Kanao Sensei didn’t seem to mind getting my blood on the floor of his garage, and I would often go back to Hiroshima with my knuckles covered in bandages, which made for great conversation in my English classes the following week. Call it masochistic if you will, but it certainly did foster a spirit of determination, focus, mental control, and perseverance. 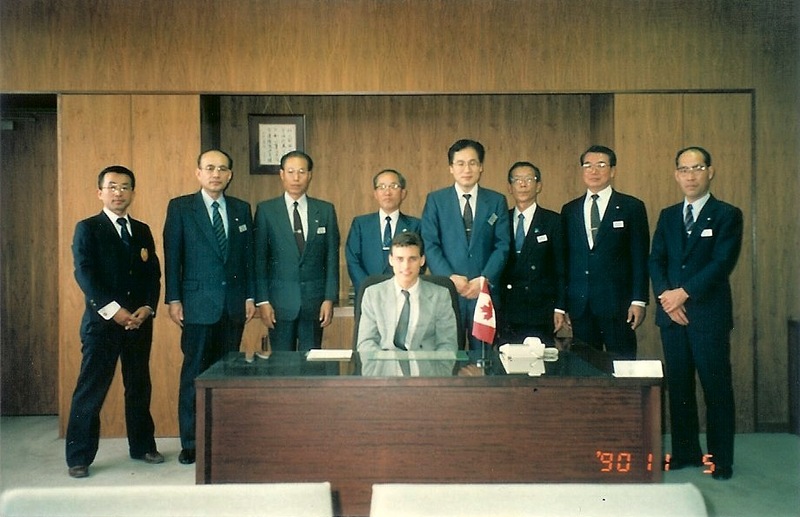 Kanao Sensei worked at the Fukuyama City post office, and without really realizing what was happening, before I knew it I was postmaster-for-a-day, and was interviewed by the local media, appearing in the local newspaper (photo below – Kanao Sensei is on the far left). There weren’t many foreigners around those parts in those days, and it appeared that they found me to be just as exotic as I was finding everything about this new country to be. It was quite an experience for a 19-year-old with only half of a college education, from a town of 3,600 people on the other side of the world, and as life goes, it was shaping my future much more profoundly than I could have guessed at the time. Having now become used to my work schedule, and having established a relationship and training regimen with Kanao Sensei, the next thing to do on this great adventure was to track down Masaaki Hatsumi, the legendary ninja master. I say “track down” because it was still before the Internet, and ninja masters were not advertising. I had no address, no phone number, no connection with anyone who was training with Hatsumi Sensei. All I had was a couple of books by Stephen Hayes, and the only location mentioned in the particular books that I had was the historical region of Iga, currently known as Iga-Ueno, in Mie Prefecture, about 6 hours by train from where I was living. 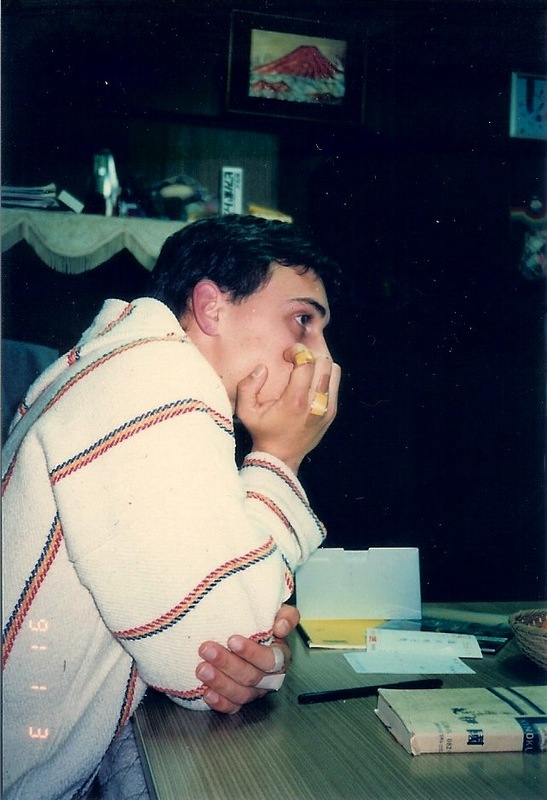 And so, once my schedule allowed it, in October of 1990, I set out for Iga in search of Masaaki Hatsumi. Posted on April 12, 2012, in Bujinkan, Life in Japan. Bookmark the permalink. 4 Comments.